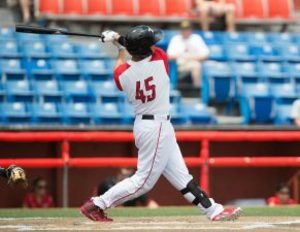 With the American Association season under wraps, and the Winnipeg Goldeyes crowned as back to back AA champs, it’s always fun to take a look at season ending standouts. This week we’re going focus on three offensive leaders; Shawn Pleffner, Jabari Henry, and Matt Chavez. 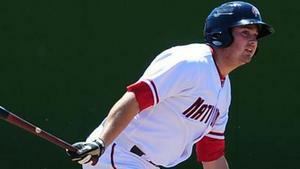 Former Washington Nationals draft pick, and current Goldeyes first baseman, Shawn Pleffner lead the AA with a .340 batting average (career high). To go with 10 home runs and 76 RBI, he crushed 30 doubles. His .897 OPS was also a personal best, and without a doubt, raised some eyebrows in the scouting world. Heck, a career .298 can’t be held in check forever. Jabari Henry, outfielder for the Sioux Falls Canaries, led the league with 29 home runs. Drafted by the Seattle Mariners in the 18th round of the 2012 MLB June Amateur Draft from Florida International University, Henry’s known for his power. After a career year in 2014 with High A High Desert, his numbers took a drastic hit once promoted to Double A (.168 BA in 2015 and .213 in 2016). After resurgent 2017 that included a .401 OBP and .617 SLG, he’s once again shown all doubters what he can do. Matt Chavez, the former Pacific Association MVP and current Wichita Wingnut, has been crushing it the past three seasons. To put this into perspective, his career batting average is .343, and over the last three seasons looks something like this; .383, .359, and .330. Consistently among the league’s best, Chavez puts up numbers like it’s nobody’s business. Whether it’s the double digit home runs, OBP in the high .400’s, or two consecutive seasons with an OPS over 1.000, there’s no reason he can’t get an invite to spring training.